"Meditations In The Key of Color" is a collection of downloadable MP3's that can be used for a regular meditation, relaxation, and chakra energy center clearing and balancing. These unique MP3's are composed with Sounds, Tones, and Atmospheres in therapeutic balance for each chakra energy center. No melody line or voice guide to distract your from the meditation experience. Specific instruments are chosen and created for each chakra energy center to help relax, balance, and clear your chakras. Each MP3 is inspired and created in a specific key for each individual chakra in the body. 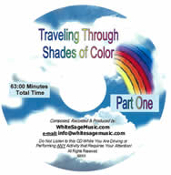 Mediations In the Key of Color ~ Copyright 2007 -2016 Copyright © 2016-2019 White Sage Music, LLC. All rights reserved.